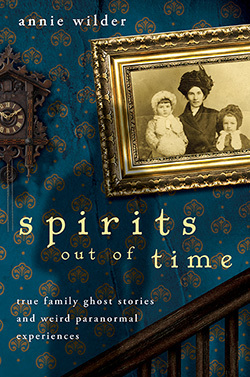 This book is a collection of family ghost stories and lore. Some of these stories I only learned about after my book came out. Other stories I’ve heard — or heard snippets of — since I was a child. I figured out that the best time to hear the most interesting stories was by hanging around the grown-ups when there weren’t any other kids around — at fancy family parties when the after-dinner cordials were served, or in the kitchen while the grown-ups took a turn at washing dishes. Many of the stories come from my mom’s Irish relatives. My Irish grandma, whom I adored, told us about “little people” and banshees and Irish beliefs regarding death, like the death knock that would be heard just before someone in the house died. My Irish great-grandmother told my mom stories about the fairies that had come over from Ireland, hidden in the trunks of the people coming to start a new life in America. And my mom, who can see and hear spirits, was followed around for decades by the ghost of a young girl. It was only recently that she learned the spirit girl’s surprising identity. On my dad’s side of the family, his German relatives had some memorable precognitive experiences. These experiences almost always involved either love or death, like my great-great grandma Wieland seeing a falling star each time one of her children died. (She lost six of her thirteen children.) Her daughter, my great grandma Schultz, had a vivid dream of a tragic event — which she discovered the next day had come true. And my dad’s father, a Montana farmer, just “knew things,” like one time being aware that there had been a car accident on the road behind him and that he needed to go back and help the people involved. My Montana grandpa also came back to visit my grandma after he died. My parents’ house has a few ghosts of its own. My mom and dad have lived there for thirty-some years, and it seems to be getting more and more haunted as time goes by. There’s a smoking ghost, the spirit of my mom’s dog George, and even a ghost who strummed a guitar in my parents’ bedroom one night. I’ve learned that it’s not that people don’t have ghost stories, it’s that they usually don’t tell them. Their encounters with the spirit world are hidden away, doubted, denied. But like ghosts themselves, they’re never quite completely gone . . .
All of the stories in this book are true, all fall outside of the realm of commonplace reality, and hopefully, all of them reveal at least some of the secrets of the spirit realm, that invisible world of untold stories.